Want a workshop or seminar on the college admissions and financial aid processes for your middle or high school parent meeting, student assembly, community event, PTSA meeting, or association gathering? How about hosting a workshop on study skills and how to be successful in college? Check out Stan Lemons’ presentation and workshop topics listed below, then book Stan Lemons as your next speaker. Stan engages and connects with his audience. He is personable, down-to-earth, and not afraid to share his inspiring personal story as a first-generation college graduate. Want to create educational opportunities for students in your community? Book Stan Lemons today. Anyone wanting to make a positive difference in the educational outcomes of students will be well served by booking Stan Lemons. By the end of Stan’s workshop, students walk away with action steps that they can immediately implement. If you want to increase your school’s student retention and graduation rate, book Stan Lemons today… you’ll experience a positive difference. Stan’s presentation on the 10 Unshakable Principles for College and Career Success is a winner. During his presentation, Stan shares 10 principles of success that stand to serve as a life-long roadmap for students. Lemons motivates students to do their best in school and beyond. If you are looking for a speaker to impart practical and real-world insight for middle school, high school, and college students, then look no further. Book Stan Lemons today. You’ll be glad you did. “I have been a high school counselor for the past 27 years, and I had the chance to read a remarkable book by Stanley Lemons. 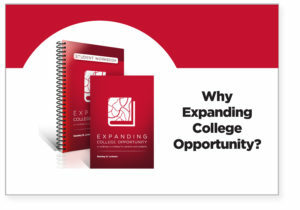 The focus of Expanding College Opportunity is to help students prepare for college. It is written in a way that parents and students can understand. 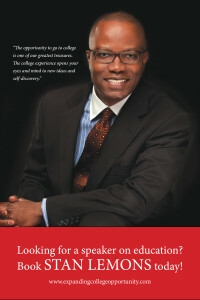 The book pushes students to create short-term and long-term plans to ultimately get them to college. Stanley was recently invited to come and speak to 9th and 10th grade students at Coeur d’Alene High School. He immediately engaged with the students and told a passionate story about growing up with limited financial resources yet meeting the challenges required to attend Amherst College. Our students greatly benefitted from listening to Stanley’s story and being able to ask him personal questions. Stanley is very open and honest with young people. He easily connects with them and offers valuable insight about how to manage the process to be accepted to college.